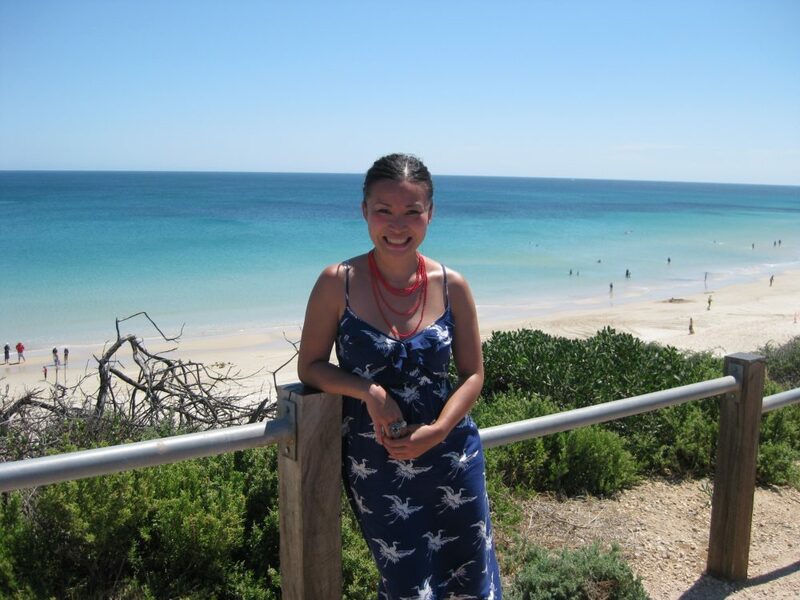 Poh at Port Willunga, South Australia. At sunset on Sunday February 27, 2011, my partner and I headed down the cliffs at Port Willunga, one hour south of Adelaide, for a romantic dusk picnic. Bizarrely, it seemed 2000 others had the same idea. They’d come for One Magic Bowl, a unique outdoor event in a program of food films during the 2011 Adelaide Film Festival. It was more about eating than film, although stills were projected on to the cliff faces after the sun went down. On the beach eleven chefs from the region had created their own fish dish using locally sourced produce. They included David Swain (Fino, Willunga – ED; Fino has since moved to Barossa Valley), Billy Dohnt (Salopian Inn, McLaren Vale) and Rebecca Stubbs (The Retreat at Chapel Hill Winery). With such a great choice of meals on offer, it was disappointing to discover that we could only select one dish. The menu was truly multicultural: there was curry, congee, chowder, ravioli and couscous. I took the advice of special guest and local celebrity Poh Ling Yeow of ABC TV’s Poh’s Kitchen and tucked into a broth of snapper with blue swimmer crab, fennel and orange. This was the creation of Glenn Worrell, the chef from the Victory Hotel at Sellicks Beach. Gay Bilson, renowned Australian restaurateur and author of Plenty: Digressions on Food lives in the area. With her previous experience in large, food-sharing events, Bilson agreed to direct One Magic Bowl, naming it after Lolo Houbein’s One Magic Square which promotes growing your own food, starting with just one square metre of garden. We ate from deep ceramic bowls designed by award-winning ceramicist Prue Venables, who recently took up the role of Creative Director at the Jam Factory in Adelaide. Venables invited local potters to work against the clock and produce bowls in time for the event. The beaches on the Fleurieu Peninsula are ribbons of white sand, the sea is a flat turquoise and the pale terracotta and cream cliffs resemble the glaze on our dinner bowls. They were made with clay sourced from South Australia’s historic Bennett’s Pottery at Magill. To complement the beach theme, each one had a seaweed motif stamped inside it. In this summer of unpredictable weather the gods were smiling and gave us a 37-degree day with clear blue sky which mellowed into a perfect evening. 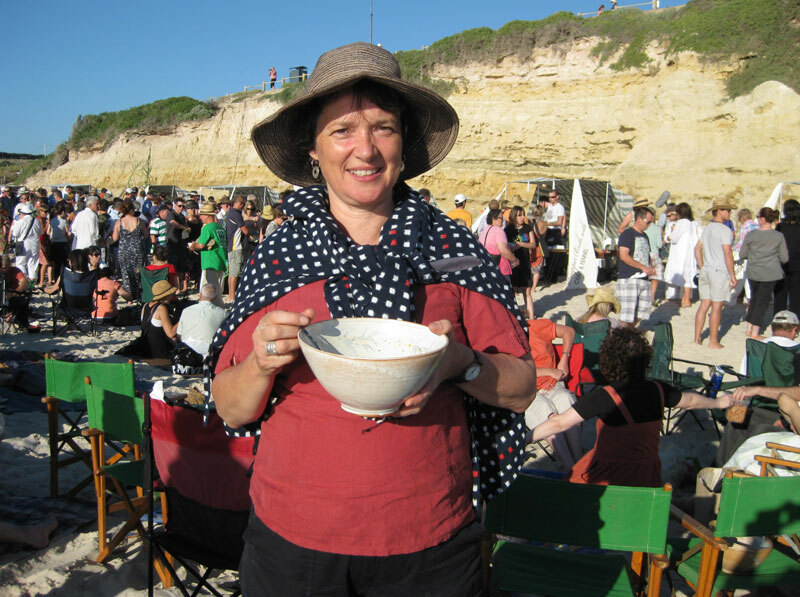 Juggling food and drinks on a crowded beach was a challenge and despite the event being advertised as offering ‘local’ wines the only one for sale was Yalumba from the Barossa Valley. McLaren Vale boasts many wineries and the vineyards stretch down to the sea, so it was a shame we couldn’t sample them. At $30.00 a ticket it was extremely good value for money. I came away with a full tummy, memories of sunset over the water and a beautiful ceramic bowl to take home to Melbourne. OMG I have just seen your event from 2011 on TV wish I had experianced it, look and sounded wonderful.